Review: The Athenaeum of Ohio is the cornerstone of the Archdiocese of Cincinnati. From its 75-acre campus in Cincinnati's Mount Washington suburb, the Athenaeum serves a 19-county archdiocese serving more than 550,000 people. Of the 3,100 living Athenaeum of Ohio graduates, over 1,500 are ordained priests. In addition, there are more than 500 lay alumni of the Athenaeum, ministering directly in parishes, schools, human services agencies and similar organizations. 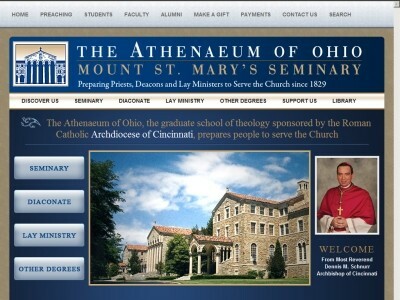 The academic programs at the Athenaeum of Ohio are offered through three divisions: Mount St. Mary's Seminary, the Lay Pastoral Ministry Program (LPMP), and the Special Studies Division. The seminary division offers a Pre-Theology Program and the Master of Divinity degree to candidates for the Roman Catholic priesthood. The LPMP offers the Master of Arts in Pastoral Ministry degree as well as a certificate program in lay ministry. The Special Studies division offers Master of Arts degrees in Biblical Studies, Theology and Pastoral Counseling as well as the Deacon Formation program. Individual classes are also open to qualified non-degree students.